How’s that feel, Kentucky? No NCAA bid. 1st round loss in the NI-freaking-T… and now you’ve got Christian Laettner trolling you… 21 years later. Think he loves March Madness? Check out that avatar. Dude played in the NBA for 13 seasons. THIRTEEN! He was an NBA All-Star in 1997, and the best moment of his life was that shot. 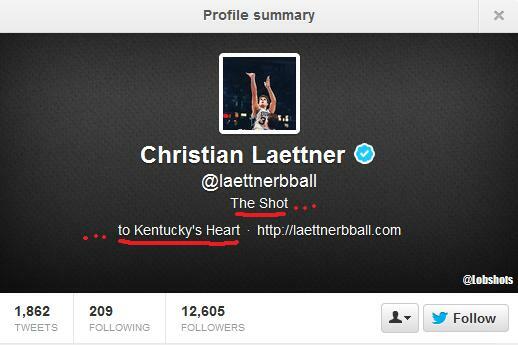 Nobody on the planet loves March Madness more than Christian Laettner. Nobody. This entry was posted in Basketball, March Madness and tagged Christian Laettner, Christian Laettner duke, Christian Laettner the shot, Christian Laettner twitter, duke, Kentucky. Bookmark the permalink.